Jake grew up in small town coastal town in Massachusetts. After completing his degree in international business from the University of Denver, he was positioned in Costa Rica as a Peace Corps volunteer to work with a team focused on community economic development and conservation. When that service ended, he stayed in the country to manage a small solar powered eco-lodge on the Osa Peninsula. This experience developed into a greater passion for renewable energy and sustainability leading him back home to apply that passion to the progress taking place in New England. 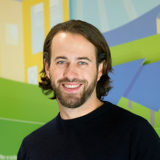 Before joining SunCommon, Jake worked at the community level in Massachusetts to spread the adoption of energy efficiency and solar energy options for residents throughout the state. During that time he also completed a MBA in Sustainability at Antioch University in Keene, NH as he saw this program representing the belief that values led business can and should be a driver for social and environmental change in our world. Now at SunCommon, Jake is thrilled to be working with the organizing team to engage Vermonters on the value and benefits of going solar! Outside of work you can find Jake hiking, rock climbing, biking or snowboarding in the beautiful mountains of New England.